‘If you seek her monument, look around you’. Twenty years after her resignation – a third of a century after she came to power – Mrs Thatcher dominates the airwaves in death as she did in life. The wall-to-wall coverage, the acres of newsprint and the arguments in workplaces and social media display a country still captivated by the Thatcher phenomenon – and still wrestling with its complex legacy. Margaret Thatcher broke the rules of British politics. She was the first woman to achieve the premiership, the first since the 1820s to win three general elections in a row. She was the rebel leader of an establishment party; a ‘Conservative’ who boasted of having ‘changed everything’. Standing on the steps of Downing Street, in 1979, she prayed with St Francis of Assisi: ‘Where there is discord, may we bring harmony’. Yet she polarised opinion like no other figure since Cromwell. Something about Mrs Thatcher inflamed the imagination. For her admirers, she was a new Churchill: the woman who had saved Britain from national collapse. For her critics, she destroyed British industry and blighted the lives of the poor, while unleashing a new ethic of greed and individualism. Adoring crowds sang to her at the Conservative Party conference; pop stars sang of ‘Margaret on the Guillotine’ and ‘The Day that Thatcher dies’. In 1984, she came closer to assassination than any Prime Minister since Peel, when the IRA exploded a bomb in her hotel during the party conference. Combative by temperament and Manichean by instinct, Thatcher saw herself as a war leader. As Prime Minister, she invoked the spirit of Pitt the Elder in 1756: ‘I know that I can save this country, and that nobody else can’. She was contemptuous of opposition, mocking those who ‘drooled and drivelled’ about the welfare state. She assailed trade union leaders as ‘the enemy within’, and derided her Conservative critics as ‘Wets’. She once told a rally that she ‘came into politics because of the conflict between good and evil’, and she liked to quote Edmund Burke’s famous dictum, that ‘All that is necessary for the triumph of evil, is that good men do nothing’. It was a personality that matched her times. Thatcher operated in a period of global conflict, when the Cold War was at a peak and the Campaign for Nuclear Disarmament was a significant political force. It was a Soviet newspaper that gave Thatcher her most famous moniker - 'the Iron Lady of the West’ - and her strange alliance with Ronald Reagan shaped her reputation. At home, the British economy was undergoing severe and traumatic change. From 1979 to 1982, Britain lost almost 25% of its manufacturing output. As inflation and interest rates soared, as unemployment rose to 3 million, rioting erupted in many major cities. From 1984 to 1985, the government faced a year long stoppage in the coal industry, as the National Union of Miners fought to save their pits from closure. Even the party system fractured, with a new Social Democratic Party taking a quarter of the vote in 1983. Thatcher revelled in this environment, which played naturally to her brand of eschatological politics. ‘The Old Testament Prophets’, she proclaimed, ‘did not go out into the highways saying, “Brothers, I want consensus!”. They said, “This is my faith and my vision. This is what I passionately believe”’. She used the premiership as a pulpit, from which she waged holy war on socialism. The ‘real case against socialism’, she believed, was ‘not its economic inefficiency. Much more fundamental is its basic immorality’. She liked to remind her opponents that ‘Nazism’ was short for ‘National Socialism’, and she set out to eliminate it from British society. To that end, her governments carried through the most dramatic reforms of any ministry since the 1950s. All the major state industries – almost a quarter of the economy in 1979 – were either sold off or prepared for privatisation. A million council houses – homes rented from local government – were sold to their tenants. The top rate of income tax was slashed from 83% to 60%, while the basic rate fell from 33% to 30%. Though the total share of taxation taken by the state did not fall (in 1983, it rose to 43.7% of GDP), it now fell more heavily on consumption than on incomes. By 1990, Mrs Thatcher could look round upon a battlefield littered with the corpses of her enemies. Trade union power was broken. The Labour Party was in headlong retreat from socialism: its leaders would soon abandon the very word. Even the Soviet Union was in its death throes. ‘As Socialism goes down all over Europe’, Thatcher exulted, ‘so it will be in Britain. And tomorrow, as today, will be ours’. Yet nemesis was waiting with the frying pan. Within six months, Mrs Thatcher was gone – the first prime minister since Neville Chamberlain to be expelled by her party while still in office. After so many years of success, her ear for the public mood had begun to fail. She adopted an increasingly regal style, and launched a reform of local taxation that outraged even loyal Conservatives. Her handling of colleagues becoming increasingly imperious, and ultimately cost her their loyalty. At the same time, ‘Thatcherism’ itself was losing coherence. With the Soviet Union gone, socialism in disarray and the trade union movement emasculated, Thatcher had lost the enemies that defined her politics. Her growing hostility to the European Community opened wounds within the Conservative Party that have never entirely healed. Her pugnacious style seemed ill-suited to a more placid political climate, which would replace her with the reassuring, but unexciting, John Major. Unexpectedly returned to civvy street, Mrs Thatcher found her enforced retirement uncomfortable. This was not solely because she had few interests outside politics. The world outside Downing Street was very different to the one she remembered, and she found it a strange and disorienting place. She was uneasy with the hedonism of consumer society. She was puzzled by financial services and disapproved of the more liberal social attitudes of the 1990s. She struggled to understand her unpopularity in Scotland and Wales, or the growing demand for devolution and self-government. Like the sorcerer’s apprentice, she had unleashed forces that no politician could control. ‘Thatcher’s Britain’ was a place that puzzled and alarmed its creator. In this respect, her legacy is shaped as much by her failures as by her many triumphs. Growing affluence and consumer spending had not, as Thatcher expected, propelled a return to traditional moral values. Instead, Britons took advantage of cheap credit to build up record levels of personal debt. Divorce and single-parenthood continued to rise, while attitudes towards homosexuality and drug use became increasingly liberal. Thatcher took to the pulpit to proclaim her own vision of the good society, in sermons to the Church of Scotland and St Lawrence Jewry. But her words seemed nostalgic, rather than prophetic. Whether Mrs Thatcher was a great prime minister depends, ultimately, on one’s values; it depends, also, on one’s experience of the Thatcher era. 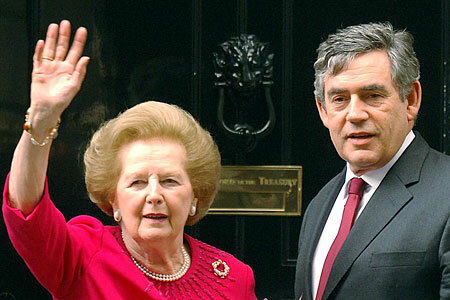 For millions of ordinary families - who bought their own home, took their first holidays abroad, began a small business or bought shares in the privatised industries - Thatcherism was life-changing and life-enriching. It gave them opportunities that had never been within their reach, not just for themselves but for their children. For millions of others, its legacy was very different. For miners, shipbuilders and steelworkers; for the unemployed, the poor and those whose businesses collapsed, the experience of the Thatcher era could be one of misery, bitterness and despair. As battle is rejoined in studios across the country, Mrs Thatcher will divide opinion in death as she did in life. As the most combative politician of her generation, she would want it no other way.